With Arabian Sea on the west side and towering Western Ghats on the east networked by 44 rivers Kerala enjoys unique geographical features that make it attractive to travelers. While the busy shoreline with its beaches and backwaters is most sought after, fewer people see the more tranquil eastern side. Those who seek out the eastern region are rewarded with stunning views of high mountains, gorges, and deep-cut valleys. What better way to experience this region than traversing it on bikes leisurely, breathing in the refreshing clean air? 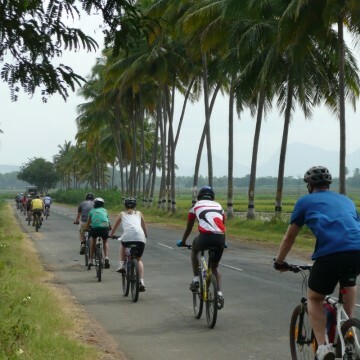 Besides trekking and Jungle safaris, cycling in Periyar is one the best leisure activities. On this experience we have a qualified team of professionals lead you through thick evergreen forests, cardamom estates and spice gardens. We will stop at a spice plantation for a guided visit, where you have the opportunity to learn about the different spices used, their medicinal use, the cultivation techniques. We will also stop for a picnic lunch at a suitable spot. Pick up and drop off at Periyar. Exact pick up location and contact details will be communicated to you by email. Carry insect repellent and sunscreen. Wear gym shoes, so that you can easily ride a bicycle. If you have any food allergies, please mention them to your guide.